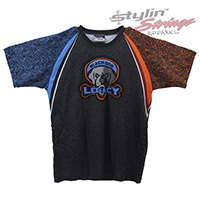 Our mock mesh or 4 way stretch shooting shirts can be worn as a performance style warm up shirt. 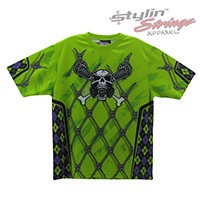 The men's are offered in a Raglan or Set in sleeve with a women's version to match. The women's are tapered and offered in a U-neck or V-neck. 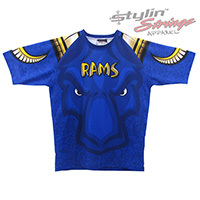 You can add names and numbers custom to any garment. Our design team is on the cutting edge for the new age of sports apparel. 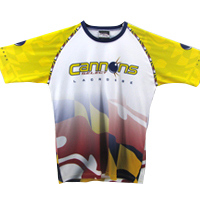 A raglan shooting shirt can be simply described by the bodylines of the sample picture to the left of the Cannons shooter. The template from the armpit to the shoulder curves up into the neck. We usually choose the cut based on what the art gives us. Some designs may look better on a Set-In style below. 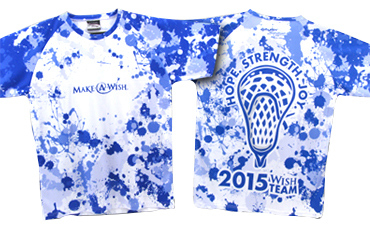 Choose mock mesh or a four way stretch fabric for these. Set-In Sleeves are more like a traditional t-shirt with square shoulders. Same as the raglan style above, we decide which cut we use based off of the art, bodylines, or logo design going on the front of the shooter. This shooting shirt is tapered in the mid section adding to a more feminine fit with a U-neck. 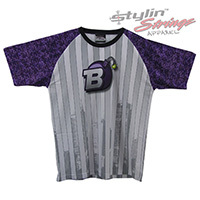 The raglan style, like the men’s has a bodyline that arcs from the armpit up to the neckline. This is also available in a set-in sleeve. We have since also made the cut an inch or two longer with feedback from ladies of all ages. 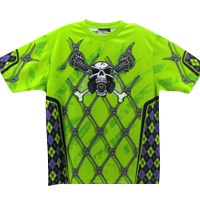 This V-neck shooter comes in raglan or set-in. It is also tapered in the mid section to optimize the fit. This has been the more popular cut for spirit wear. 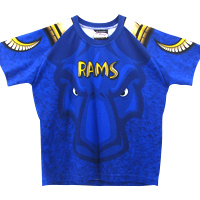 You can go with mock mesh, soft t-shirt, or 4-way stretch fabric.